If the use of "pence" in the ad didn't give the location of this story away for you, know that this deal is currently only being offered at GameStops in the UK. The gist of the bargain, as illustrated in the picture on the right, is that Battlefield 3 purchasers will have an opportunity to trade their game in for an exceptionally cheap Call of Duty: Modern Warfare 3 option. Like, 99p cheap. That's right around $1.50, if your sterling scales are off. If you buy Battlefield 3 from GameStop's online shop before October 27th at midnight, GameStop will send you a return envelope when they ship the game. They are automagically doing this, so one has to assume that the company sees Battlefield 3 as potentially performing below expectations. Why else would they automatically be sending envelopes with every Battlefield 3 purchase? Here are the instructions for those in the UK that want to take part in this madness. Notice, I've left the author's spelling intact…mostly because I laugh every time I see how this crazy person wrote Xbox 360. 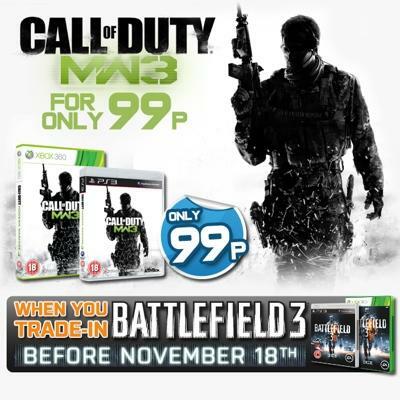 Purchase a copy of Battlefield 3 for either the PlayStation 3 or for the X-Box 360 through www.gamestop.co.uk by no later than 11.59p.m.on October 27th 2011. A pre-paid postage envelope will be sent out with the Battlefield 3 games to every customer. Purchase a copy of Modern Warfare 3 for either the PlayStation 3 or for the X-Box 360 through www.gamestop.co.uk by no later than 11.59p.m. on November 7th. Return the copy of Battlefield 3 to GameStop in the pre-paid envelope provided so that we receive that copy by no later than 6pm on Friday 18th November. The Trade-In Offer shall only apply to versions of Battlefield 3 and Modern Warfare 3 that are compatible with either the PlayStation 3 or for the Xbox 360. Honestly, we don't even know what to think about this offer. It seems like a really, really odd move for GameStop. We suppose they're just looking to stock up on used Battlefield 3 copies? Maybe? Or, perhaps, GameStop is banking on the fact that players will absolutely love Battlefield 3. Consider this: you're new to the Battlefield line, but you've been playing Call of Duty forever. You see this offer and think, "Yes, I'll try this new shooter everyone's talking about; if I don't like it, I'll return it and get this game I know I'll love for practically nothing." Now, you fall in love with both games and GameStop has guaranteed that both purchases happen in their store. At least, we hope that's the case. Everything else seems either too stupid or too sinister.